I honestly don't see anything wrong with this. No one is sitting near them. Some train rides are over an hour and how do you know these people don't have a medical condition that requires they elevate their legs? What a horrible society we live in. Shame on you for being so quick to judge. ^ Says the foot rider. Sorry. I'm not buying what you're selling. Browse away from here. Shoo. I wonder how you could walk to the train if you have to keep your legs elevated? MPFC might have explained it all, I'll have to check. People aren't sitting near these people because they don't want to risk possibly smelling feet. True, some people have invisible conditions, but in my opinion feet on the seats is never okay. Anonymous, most workdays are over seven hours, but I don't think our bosses would appreciate us putting our feet on our desk, or another chair. 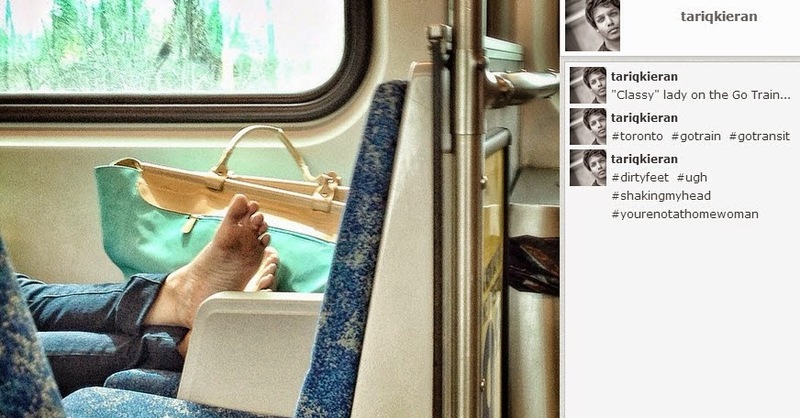 If you can keep your feet down at the office, they can keep their feet down for the duration of the train ride.